Google on Wednesday launched a range of new products including the latest generation of the Pixel phone, two additional Home speakers, a high-end Pixelbook, and wireless headphones Pixel Buds at an event in California. 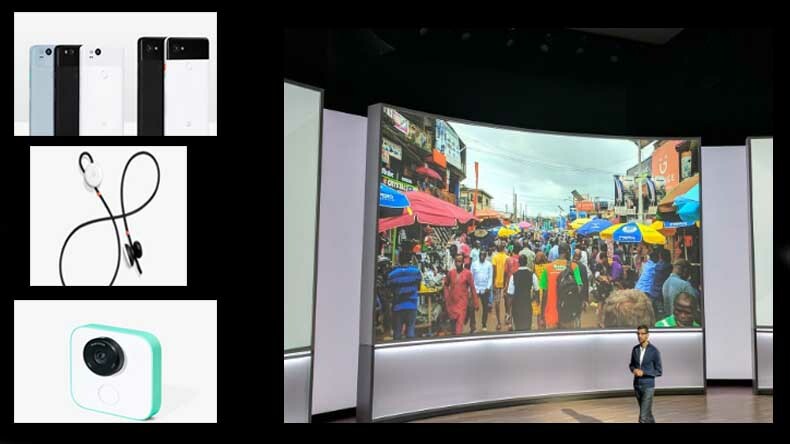 Google on Wednesday unveiled a range of new products including the latest generation of the Pixel phone, two additional Home speakers, a high-end Pixelbook, and wireless headphones Pixel Buds at an event in California. Google’s senior vice president of hardware Rick Osterloh began the show with the announcement that the company is introducing its second generation of Google-made hardware. New Pixel Phones: Google unveiled the new Google Pixel 2 smartphones at the event — Pixel 2 and Pixel 2 XL. The Pixel 2 features a 5-inch Cinematic 127-mm full-HD (1080×1920) display, while the Pixel 2 XL features a 6-inch QHD+ (2880 x 1440) P-OLED at 538ppi with 18:9 ratio. Both the phones will have Android 8.0.0 Oreo mobile operating system. The new phones will be available in 64 GB and 128 GB variants. . The Pixel 2 has a 2700mAh battery, while the Pixel 2 XL has a 3520mAh battery. Google Pixelbook: The newly-launched Pixelbook is a flexible, high-end Chrome book laptop with a touch screen and convertible design. It is the first laptop with Google Assistant and Pixelbook Pen. Google Home Mini: It is a miniature version of the Google Home. The Home Mini is “smaller than a donut” and powered by the Assistant. It will launch in three colours including coral, chalk and charcoal. Google Home Max: A high-end Google Home Max speaker is 20 times more powerful than the original Home speaker. It is powered with artificial intelligence and can modify the sound as per the environment and listener’s preference. Google Pixel Buds: The Google Pixel Bud wireless Bluetooth headphones are designed to work with the Pixel 2 phone. The coolest feature of these headphones is that they can translate languages in real-time. They will be available in three colours — White, blue & black. Google Daydream View VR headset: Google also announced a new Google Daydream View VR headset at the event. They will be available in three colours and have a new design. The new headsets will have same controller and basic features as the first Daydream View. Google Clips: Google also unveiled a new camera named Google Clips at the event taking audience by surprise. It automatically takes photos throughout the day while you might be occupied with your work. It is hands-free and can be attached to anything.